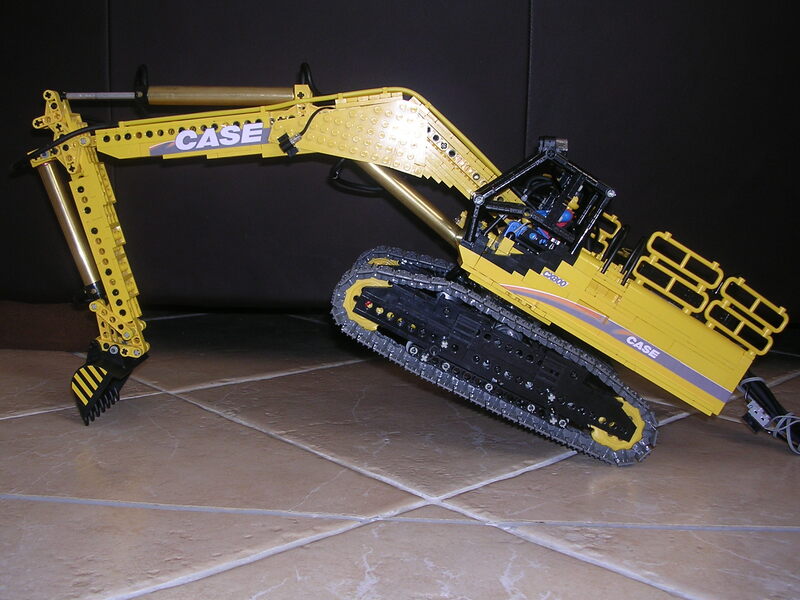 Pithivier57 is a French AFOL, who also decided to build a remotely controlled LEGO TECHNIC excavator. It is an 80 ton. CASE CX800 machine. There are some PF motors on-board to move the undercarriage and rotate the cab, while the boom, dipper and bucket are operated by pneumatic cylinders. On the remote unit there is a PF IR remote, to control the excavator undercarriage motors, and two additional PF M-motors for a compressor that feeds the model pneumatics, via a few umbilical pneumatic tubes. Main point of interest of this excavator, are their unique and extra long pneumatic cylinders custom made by the author. 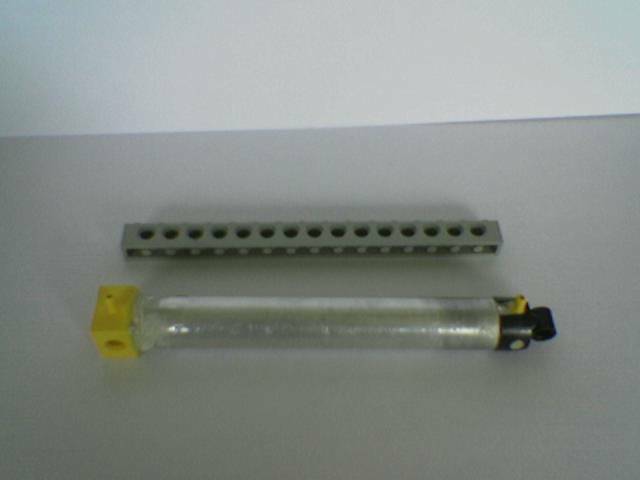 It is a characteristic from large size excavator TECHNIC models, to require long cylinders well above those produced by LEGO. While long ago some other builders have solved the problem of not having appropriate LEGO cylinders off-the-shelf, using ropes and dummy cylinders [1, 2], many others (LEGO inclusive ) have used the standard ones in a back-to-back setup to double their operative length. However, achieving this way a functional but quite unrealistic solution. This is the point where some innovative minds, decide to go for customized solutions. And so Pithivier57 did also . These seem to have been done in a very similar way, to what Pitihvier57 might have done too!? There might be also a similar custom cylinders solution, on Anders Gaasedal's Volvo Excavator [6, see it also at TBs updated Excavators "Hall of Fame" post], but it is still not clear for me and I'm waiting on Anders' feedback on this subject. 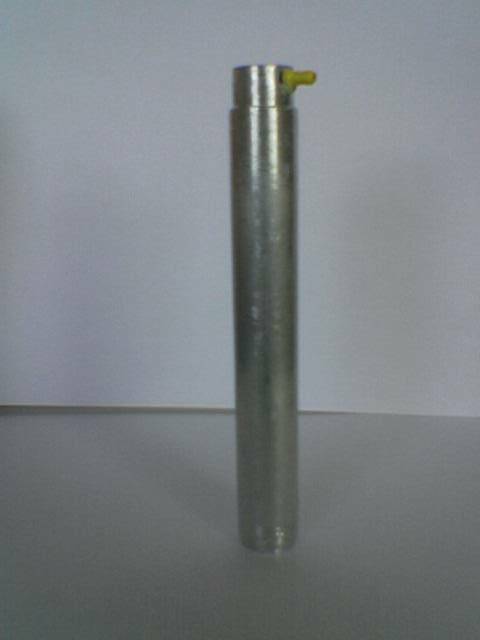 Main issue we can easily observe from Pithivier57's videos [7, 8, 9], are the cylinders sudden movements which may also look a bit unrealistic as it is the usage of pneumatic cylinders itself. In fact this is an effect that may only get worse, as the longer the cylinders get. In real life, such machines use hydraulic systems instead of pneumatic ones. They are a lot more powerful and work much smoother. However it is very unlikely that we ever come to see something similar by LEGO. Thus one chance could be to play a bit with advanced pneumatic control solutions, that would allow to control the air flow into the cylinders and stopping the cylinders in the middle for digger action. Just like those developed by Mark Bellis years ago, and of course if there is any room left inside the model to accommodate it all. As you may expect, several other photos from this CX800 excavator can be found at the author's BS folder too. LLLLOOOOOVVVVVEEEEE IT! I saw this on brickshelf a while back and I was very impressed. 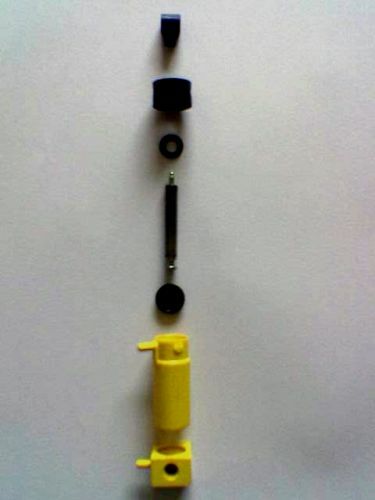 Would love lego to do something like that, Release cylinders in a range of sizes, the ones hear being the longest (for forklifts, telescopic booms, ect). I'm sure that if lego were to produce them (and maybe reavalute the design of the seals) they could be as smooth as you like. As far as I know, pneumatics can never be smooth without an overly complicated valve control! Pneumatics and hydraulics are more different than they appear: to move a hydraulic piston, you put oil (or whatever liquid) inside the cylinder until it reaches the desired position, then close the valve. 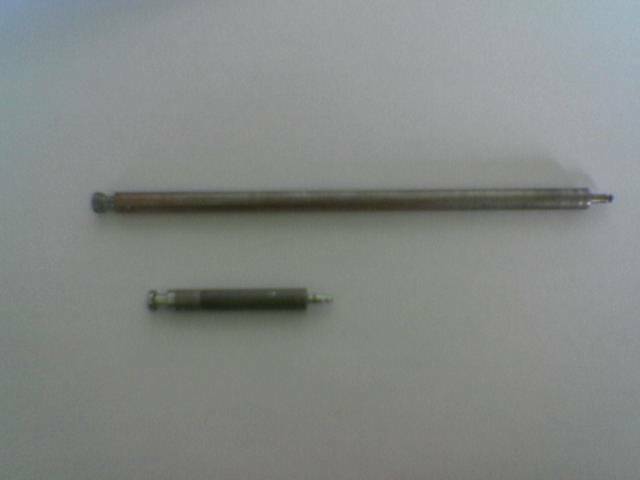 To move a pneumatic piston, you put air (or whatever gas) inside the cylinder until it exerts enough force (since the overall mass can be considered constant, enough acceleration) to move it, and regulate this acceleration to make it stop at the desired position. It's as complicated as trying to stop an "Asteroids" or "Star Control" ship in a given spot of your choice. Not only that, but if the load changes (and therefore the equilibrium of forces and, by corollary, the acceleration) you'll have to regulate the valve again to compensate. 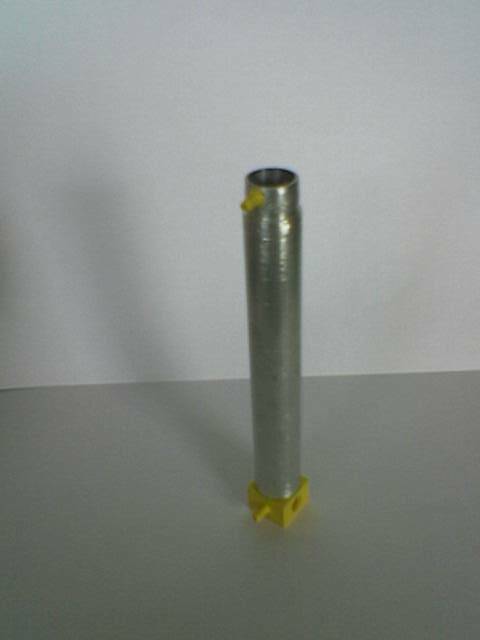 A hydraulic cylinder with its valves kept closed won't go anywhere. First, it's not messy. 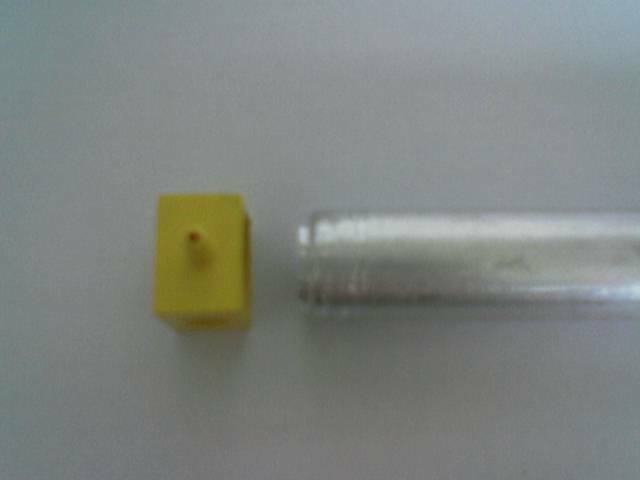 A leaky air tube is a nuisance but nothing more. A leaky water (or, even worse, oil like in real hydraulic machines) tube can be a disaster for a kid when his mom discovers what happened to the carpet the "legos" were on. Second, it's simple. With hydraulics, you'd have to have a completely closed circuit to avoid constantly pouring liquid on the pump and having it pour out of the cylinder or valve. With pneumatics, just take some of the surrounding air into the pump and let it out somewhere else (in the case of LEGO pneumatics, the switch). Very well said. I know about pneumatics and hydraulics so I probably should not have said "as smooth as you like" but diffinately alot smoother than in the video. Besides I still think that pneumatics are (among many other benefits) a hell of a lot cooler than LAs 8^). Like I always said ever since I learned about LA's: their fields of application overlap, but don't coincide. I'm glad both exist. Gotta love that pfft! haha! I also like how they can be very slow or very fast depending on how you operate the switch and how you can put them anywhere and all the rest of it, but i'm also glad they both exist as well. Just as long as they DO both exist! Ohhhhhh ooooooh oooooooh oooooooh love the update! haha! 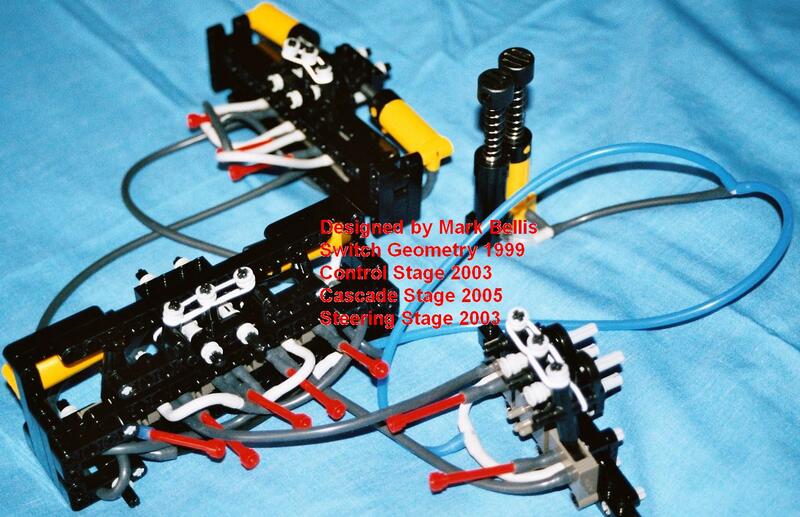 I think there are'nt many instances where you need precise control of a pneumatic actuator in a technic model. Using a small amount of skill while operating a standered valve works just fine. I can make it go fast or slow or stop wherever I want. I like that operating a large pneumatic arm like on an excavator is a game of skill that is sometimes quite challenging. It's fun!